AWS service limits are the restrictions imposed on the usage of AWS resources. Almost all services under AWS have certain service limits. These restrictions are imposed to prevent the AWS users from mismanaging their resources and cut down unnecessary expenditure. Service limits of your AWS SES should be assessed by the users at regular intervals of time to ensure that their cloud usage, as well as the expenses, should not exceed beyond the acceptable limits unnecessarily. Amazon Simple Email Service (SES) is an email platform service which provides the users, an easy and cost-effective way to send and receive emails using their own email addresses and domains. Users can also send marketing emails such as special discounts or offers and other types of transactional or confirmation emails with the help of SES. Besides, AWS SES allows the development of software solutions such as email automatic responders, unsubscribe systems etc. SES is a pay-as-you-go service, so the users pay only for the number of emails they want to send or receive. Why is it necessary to monitor the service limits of your Amazon SES? 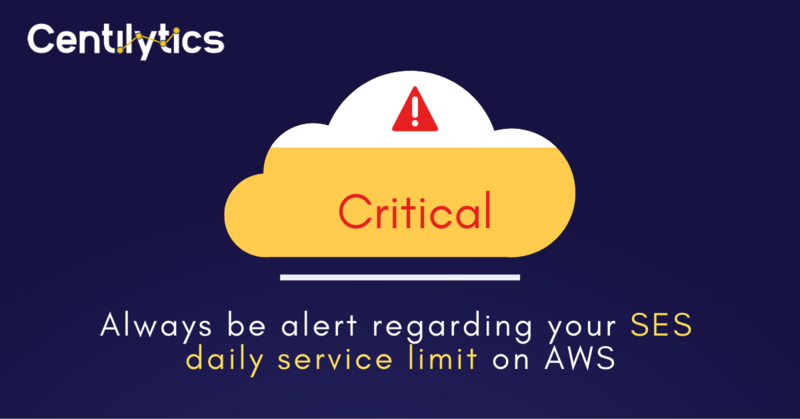 You should monitor and keep track of your AWS SES service limits regularly. AWS users who are in the process of establishing a new business might send a large number of emails, thus ignoring their daily sending limits and can exhaust their daily quota. This is where our platform Centilytics comes to their rescue. The cloud management platform gives an alert indication to the user whenever the said limit is about to reach. This is done with the help of dedicated insight on the daily service limit of SES emails that can be sent by the AWS user. OK This indication will be displayed when the user has breached less than 80% of the specified. Limit Amount: This column shows the limit of the resource which is available. Here, the limit refers to the daily SES sending quota limit. Previous articleContainers Vs VMs | Which one is better for deployment?